On October 2, Athens-Clarke County voted to accept the Athens in Motion Plan. 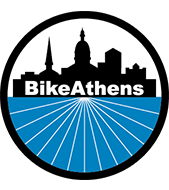 BikeAthens served on the Athens in Motion citizens advisory committee for two years. We are excited and proud to see the plan move forward. We anxiously wait to see the first group of projects get on the ground. Toole Design Group provided excellent leadership with unprecedented responsiveness to the committee and community’s input. “A Citizens Advisory Committee directed the strategic planning process and development of the network. 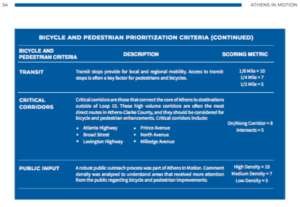 … Hearing the voice of the public regarding biking and walking was crucial in forming the recommended network and will be essential for sustaining momentum and attracting new users as the plan is implemented.” (AiM Chapter 1, p. 9). 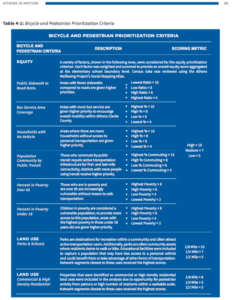 Additionally, in Chapter 4 you will find the prioritization criteria and all the Tier 1 Projects. 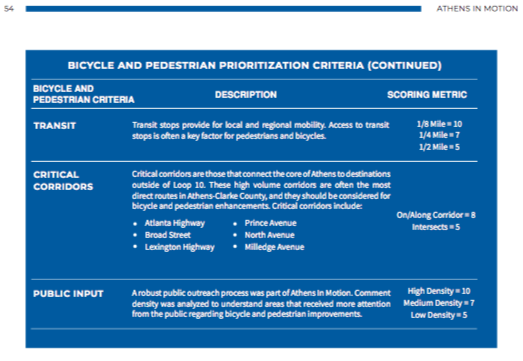 There are separate lists of biking projects and sidewalk projects. 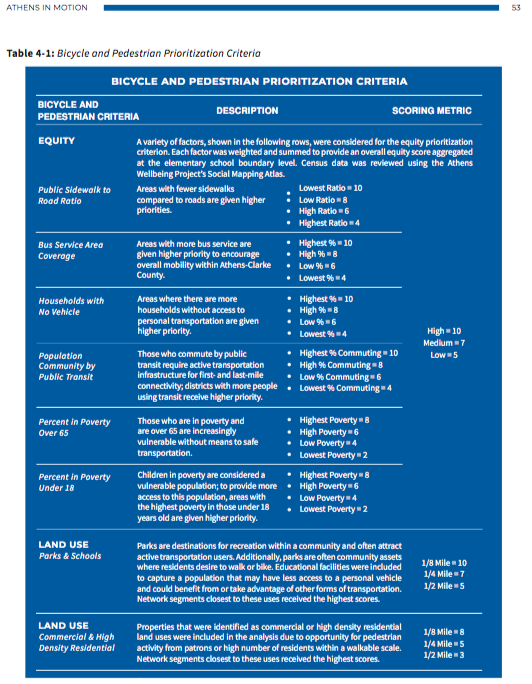 The chapter also contains a list of Greenway segments that will have a big impact on neighborhood mobility (see pages 63-70 for a full list of projects). The Appendices constitute a bulk of the document’s 262 pages; they contain reams of valuable information. 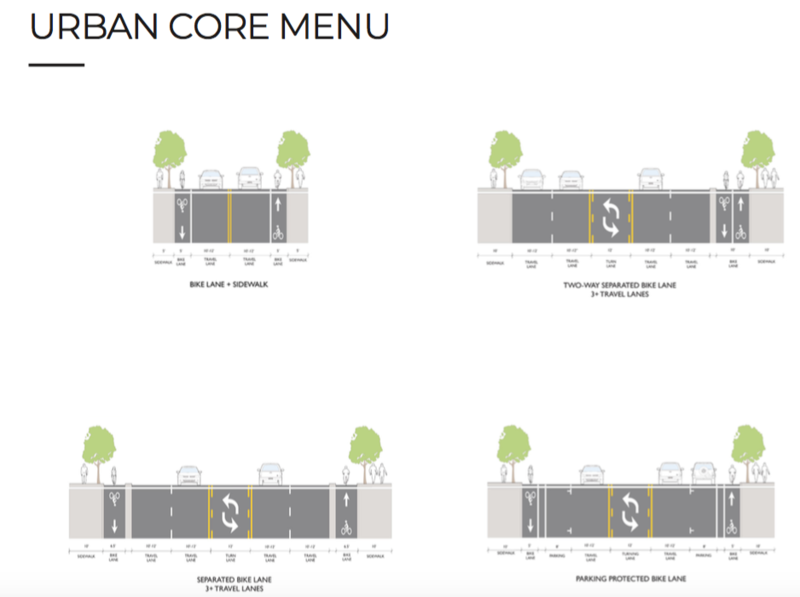 For example, Appendix B presents potential street “cross-sections” based on land-use context. Appendix D provides 64 pages of “Design Guidance.” It is all definitely worth a read. Working toward Equity in Transportation Sharrows, really?